A residential experience that feels close to home but is far from ordinary. Safe. Well cared for. When your child is away from home you want to make sure they are secure. You want them to be in an environment where it is comfortable, gives them a place to study and rest, and one that introduces them to social opportunities to enrich their academic experience. Upper School students who wish to board pay $20,000 per academic year in addition to tuition and the fee includes: room, evening and weekend meals, and dormitory activities. Plus an advance deposit is required for on-campus meals and transportation. More information can be found on our Tuition and Fees page. North Cross is affiliated with Wilson International LLC which provides an exceptional 7-day boarding experience to international and regional domestic students. 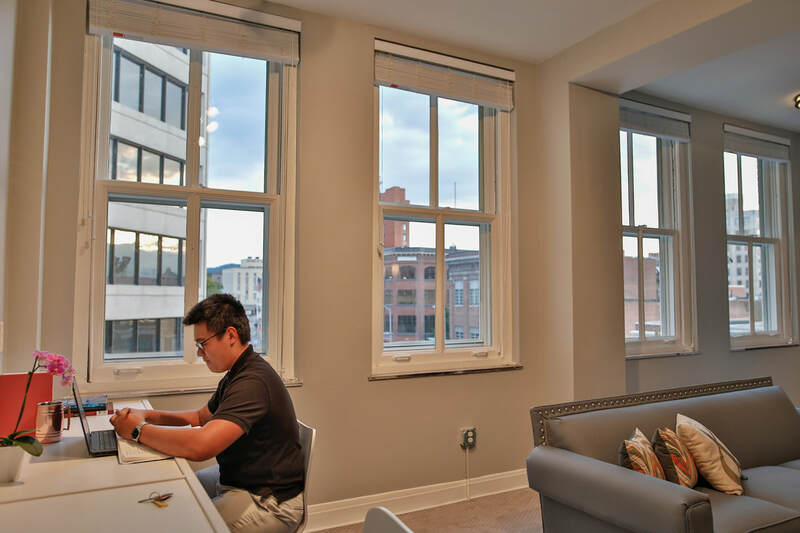 Living in a historic downtown dormitory—the newly renovated Boxley Building—students have the advantage of being close to school, and the excitement of living in an active and vibrant downtown location, close to restaurants, museums, and other features such as the farmers’ market and shopping. The best of city life coupled with a stunning rural setting makes Roanoke a unique experience for visitors and students alike. The Roanoke Valley (located 250 miles southwest of Washington, D.C., and 196 miles north of Charlotte, North Carolina) hosts many festivals, cultural events, and entertainment opportunities, all within a short distance from our campus. These features coupled with its proximity to the Appalachian Trail makes it a city with something for everyone. There are plenty of parks and walkable greenways within the city, connecting it to its surrounding neighborhoods. The regional airport is located just a short drive from the downtown and the Greyhound bus lines are conveniently dispatched from a depot within walking distance to the dorm. Amtrak Passenger rail service commenced in the Fall of 2017. Students eat their dinners and weekend brunch in the dorm's sun-drenched dining hall. The seasoned chef prepares fresh meals daily in the professional-grade kitchen, and takes requests for future offerings. For breakfast and lunch on the weekdays, students eat on the North Cross campus. On the weekends, the residential director plans “mandatory fun” activities such as a city-wide scavenger hunt that helps familiarize students with their new home, or a trip to the bowling alley. Dorm students also receive visits from friends at school. At the beginning of the school year, for instance, the Upper School Student Council Association visited the dorm for a “Minute to Win It” series of challenges. Transportation to and from the dorm is provided by the school—about a ten-minute drive away. The on-site faculty advisors allow students to have continuity, added support, and they also help to ease the transition into boarding life. In addition, the dorm houses and employs a residential director who makes herself available to students for academic, social and emotional support. Every night during the school week, students have an open-door study hall in their room from 7:30 until 9:30 during which time they can complete their assignments and reach out for help if needed. Students have parameters for their free time set in place by their guardians and are required to sign in and out of the dormitory, have their own secure entrance to the building, and enjoy on-site dining facilities. Students live in suites that accommodate three students and each has its own bathroom, sleeping area and common study and living area. One faculty member commented, "This is nicer than any college dorm I've ever seen."